Study genetic testing without electrophoresis equipment. If you want to teach your students about genetic tendencies toward disorders, but don’t have access to electrophoresis equipment, use our thorough three-part lab activity. No equipment is required, keeping your cost to a minimum. Students study genome data from Fragile X syndrome, which causes mental retardation; analyze the traits of the disorder; and construct a pedigree. 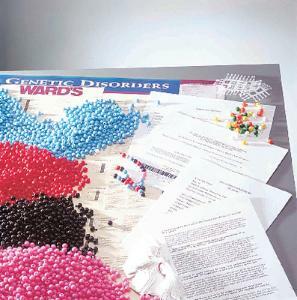 In the second part of the activity, students use pop beads and Ward's Human Genome Poster, both included, to sequence and analyze the chromosome fragment. Then students go beyond clinical lab work, participating in a role-playing session of genetic counseling to understand ethical and privacy issues related to genetic testing. It comes with enough materials for ten setups, as well as a teacher’s guide and student copymaster.